Am so happy to say that this post mark a milestone, yes my today's post is 3000th post. This is not possible without all your encouraging words and your huge support. 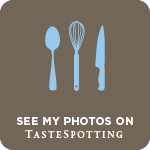 Thanks to each and everyone for being a part of my virtual culinary journey.Thanking you all from my bottom of my heart for pulling me to keep my blog alive during many crucial moments i have faced during all these years of blogging. 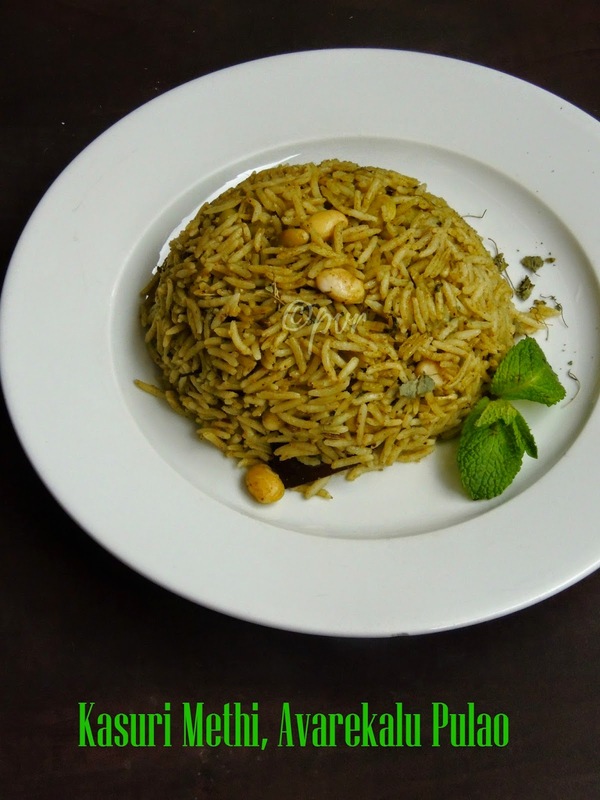 How about having this flavorsome kasuri methi and hyacinth beans pulao for your lunch or for dinner?. I love one pot meal very much, i dont forget to make them quite often. I got a packet of frozen green hyacinth beans from Indian grocery recently. Since i want to make a pulao with those frozen hyacinth beans i couldnt resist myself to make this Kasuri methi Avarekalu pulao.This one pot meal smells absolutely fabulous coz of the spice masala paste and obviously coz of the aromatic dry fenugreek leaves aka kasuri methi.This pulao makes an excellent Sunday special meal when served along with hard boiled eggs and onion raita. If you want to make a different parathas from the usual one, then take a look at this pocket parathas. This parathas are quite easier to make and i stuffed them with a simple potato and fenugreek leaves masala. This pocket parathas makes an excellent breakfast,lunch and dinner as well. 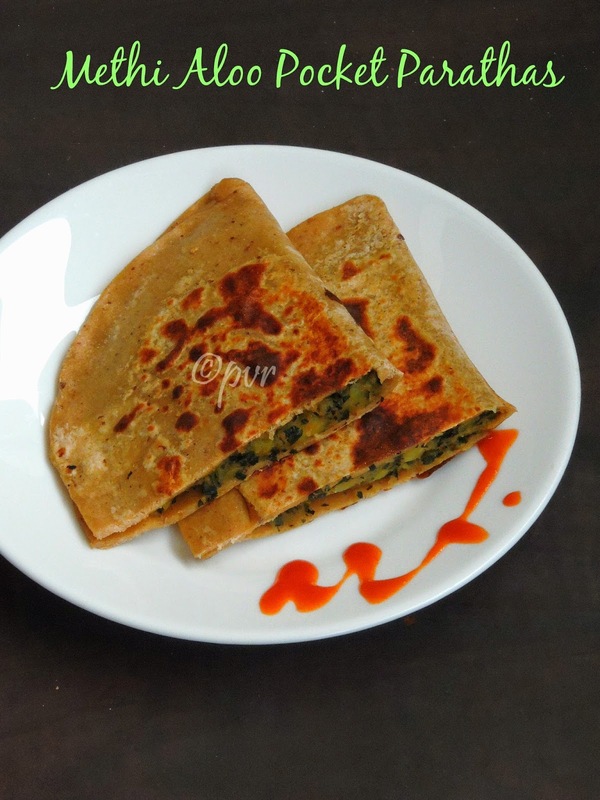 You doesnt even need any side dish to have this parathas as they are sufficiently stuffed with aloo,methi masala. Quite a different one from the usual stuffed parathas rite. I enjoyed making this pocket parathas and kids enjoyed thoroughly eventhough chopped fenugreek leaves are added in the stuffing. 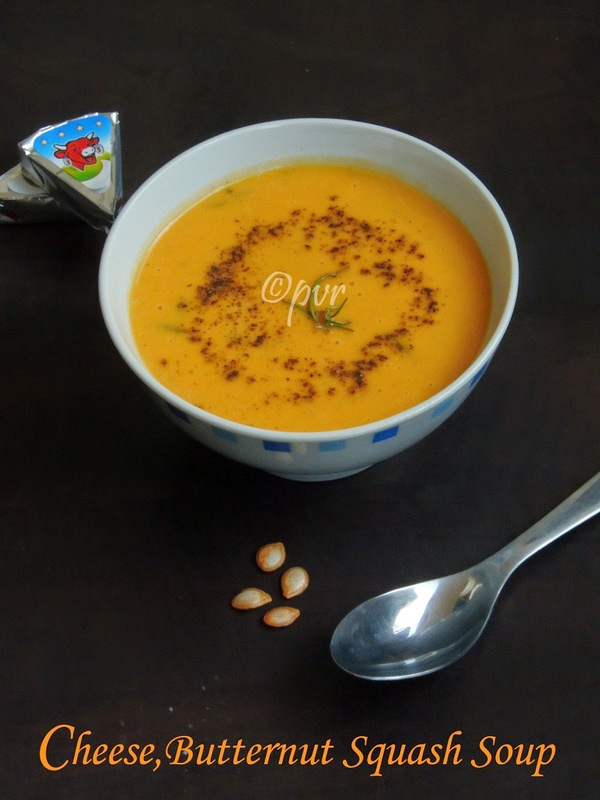 A delicious curry is quite enough to enjoy along with rotis or mildly flavoured pulaos. Its always difficult to satisfy everyone's tastebuds at home when its comes for side dish especially to serve along with rotis. Kids loves protein rich beans and Hubby like potatoes,obviously if am planning to make a side dish either i combine both beans and potatoes or else i will just stick with potatoes. My daughter's favourite bean after chickpeas is Rajma aka kidney beans. She just love this beans in anything, one of my recent trial with my family's favourite vegetable and rajma is this Sabji aka curry. 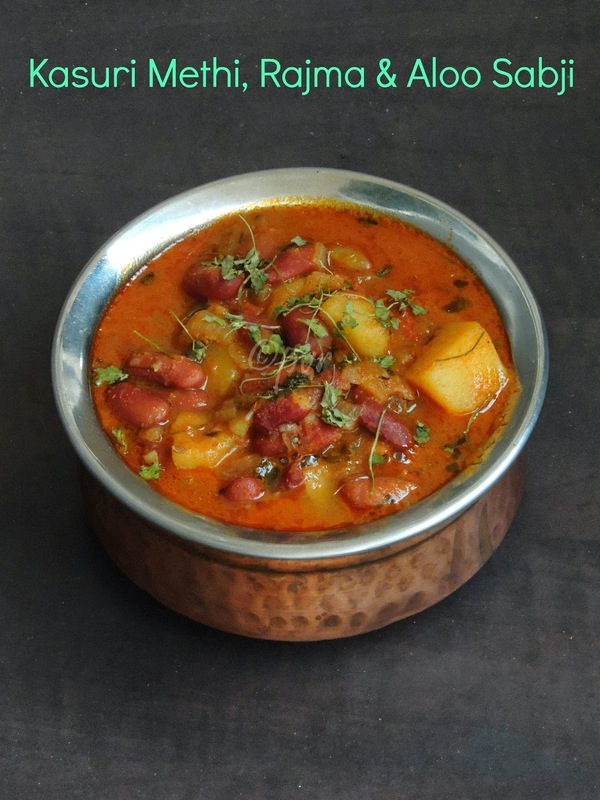 This time i simply dished out this wonderful looking curry with potatoes, dried fenugreek leaves and rajma beans. Soup is most of our dinner while the weather is either chilled or rainy, obviously i often make them as they are easy to dish out. As i told earlier, cheese have their important place in our daily menu. Cheese is rich in calcium and its a good for kids. Obviously its advised to feed kids quite often with cheese. My kids love laughing cow cheese in their soup, the addition of cheese gives an excellent smoothy and creamy texture to this simple soup. 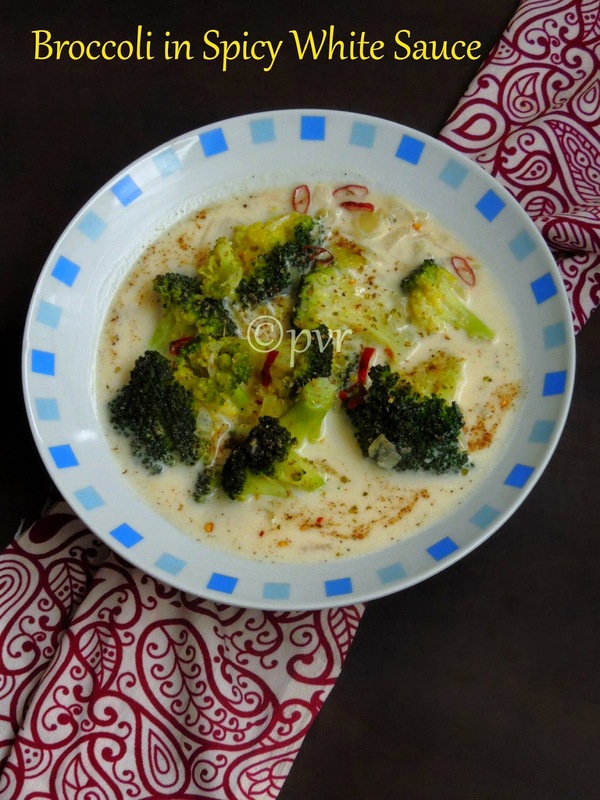 Actually i want to name this soup as Velouté as this soup came out extremely silky and creamy. 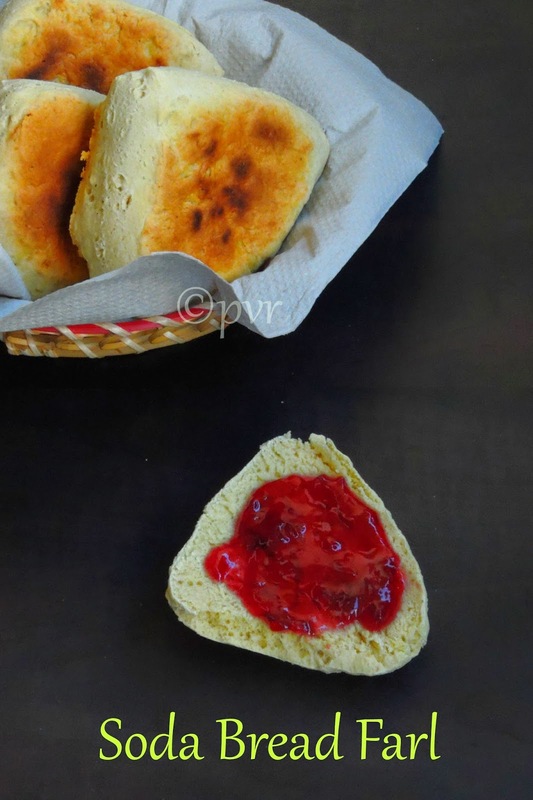 Naan, this famous yeasted flat bread is quite popular all over the world, but this cheese naan is very famous among the French peoples, they just go crazy if they hear the word 'cheese naan'. A friend of mine asked me about this cheese naan few days back while we were talking over fone. Obviously she tempted to make some cheese naan at home and i couldnt stop myself making this cheese loaded naan immediately. Actually cheese naan is made here with laughing cow cheese which makes awesome cheese naans when compared to other cheeses. However melted laughing cow cheese makes this yeasted flat bread more delicious. Cheese stuffed potato buns, yes you read it rite, but this buns are prepared simply with mashed potatoes and not stuffed with potatoes. 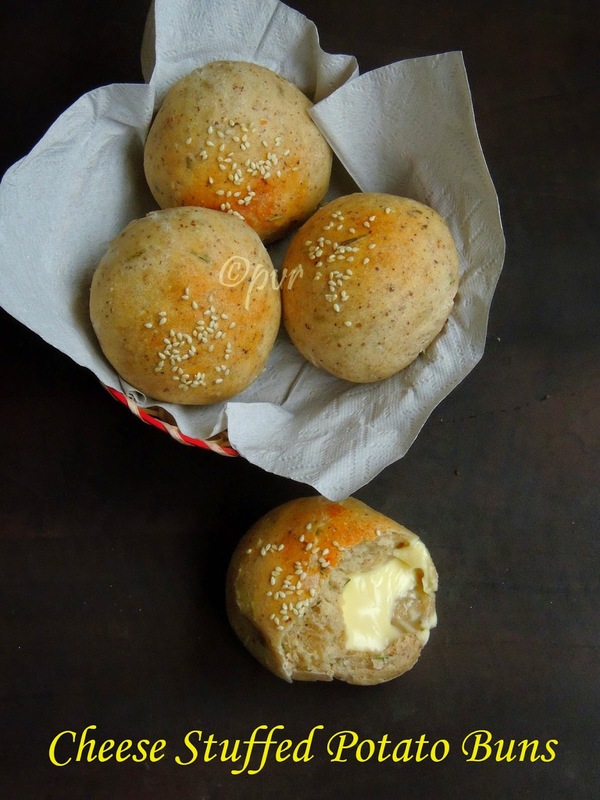 Adding cooked and mashed potato puree while making bread or bun dough makes the dough absolutely soft. 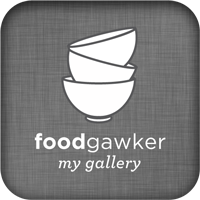 Am running my third week of blogging marathon with one ingredient in different categories.Without any hesitation, i immediately pick laughing cow cheese as my star ingredient. Obviously my today's post goes to laughing cow cheese stuffed herbed potato buns. These cheese stuffed potato buns came out extremely fabulous and my kids just enjoyed this buns when they were still warm. Melted laughing cow cheese turned out this buns dangerously addictive and they just vanished within few minutes. Dunno why suddenly my tastebuds are craving for savouries now and i dont feel like making sweets now. Obviously when i have to suggest bakes to Home Baker's Challenge, a monthly baking event,i couldnt stop myself picking few savoury muffins for this month's challenge. After numerous sweet bakes, this month's challenge goes for savoury muffins. I suggested couple of muffins to members, eventhough each muffins goes for different interesting ingredients, i sticked with this super cheesy lunch muffins. This muffins is loaded with vegetables and cheese as well. Quite an easy muffins to bake for a lunch if dont feel like making your lunch. 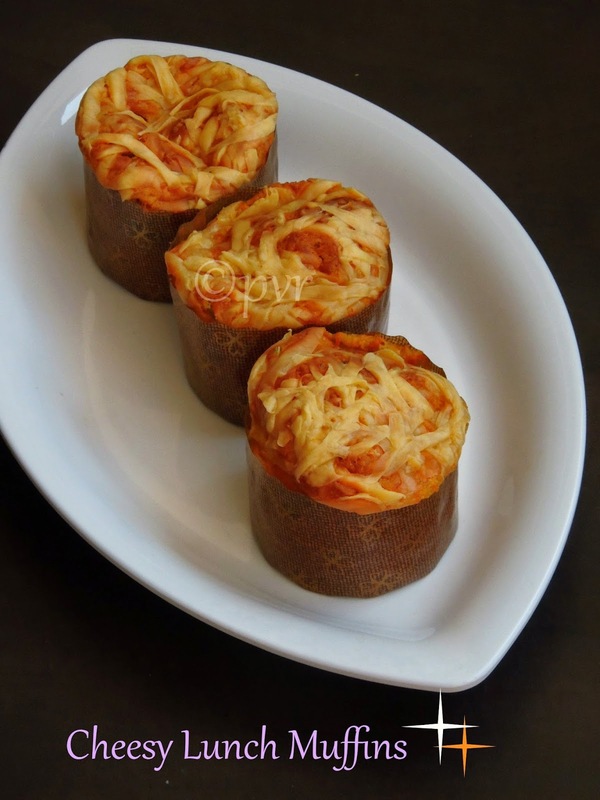 Am sure this lunch muffins is very much enough to satisfy everyone's hungry tummy. We love canned black olives stuffed with bellpepper or else with anchovy fish, but i rarely add olives in my cooking apart from using black olives as toppings in pizza. When i picked pizza in different sauce as theme for this week's blogging marathon, i really want to dish out something with black olives. 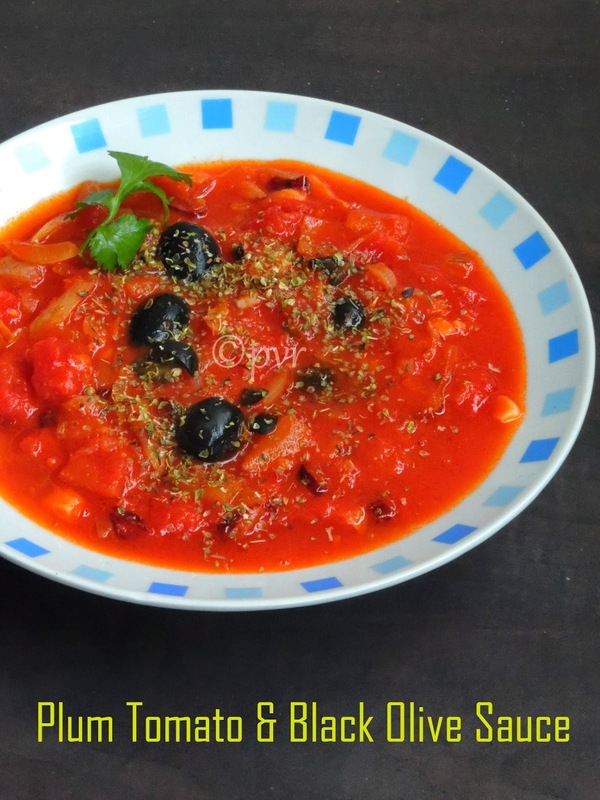 After googling, i decided to go with my favourite plum tomatoes along with black olives to serve with my pastas. Trust me, this mildly tangy sauce makes an excellent pair to enjoy with spaghetti and everyone at home enjoyed thoroughly this delicious sauce. Pesto, who will say no to this beautiful Italian sauce. 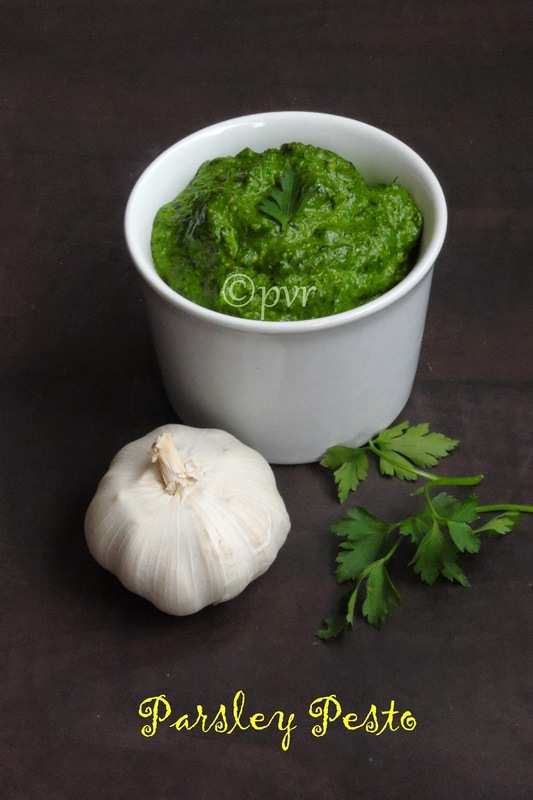 Pesto sauces are versatile, you can have it with pastas or simply as dip with bread or else to spice up any dish. Parsley pesto was in my to do list since a long as i usually get them from stores. Dunno y i couldnt make this parsley pesto earlier, but finally one fine day i couldnt resist myself to get some bunch of super fresh parsley leaves just to make this parsley pesto. I used almonds instead of usual pine nuts, pine nuts are bit expensive here when compared to almonds. In Ireland, soda bread are usually eaten as an accompaniment for main course or else for breakfast, obviously Irish soda bread goes for two colors, brown and white and they are called cake and farl. When making farls, the soda bread dough is rolled out into a rough circle and cut all the way through and in crosswise, into four pieces or farls as "farl" is a generic term for any triangular piece of baking or 4 parts, and usually baked in a heavy frying pan or on a griddle, on top of the stove rather than in the oven. It's a flatter bread than cake, and moister after the baking's finished. Each farl is split in half "the wide way" before eating. Its best when eaten hot once gets cooked in the griddle, but sometimes its allowed to cool and then grilled or fried to have along with other dishes. 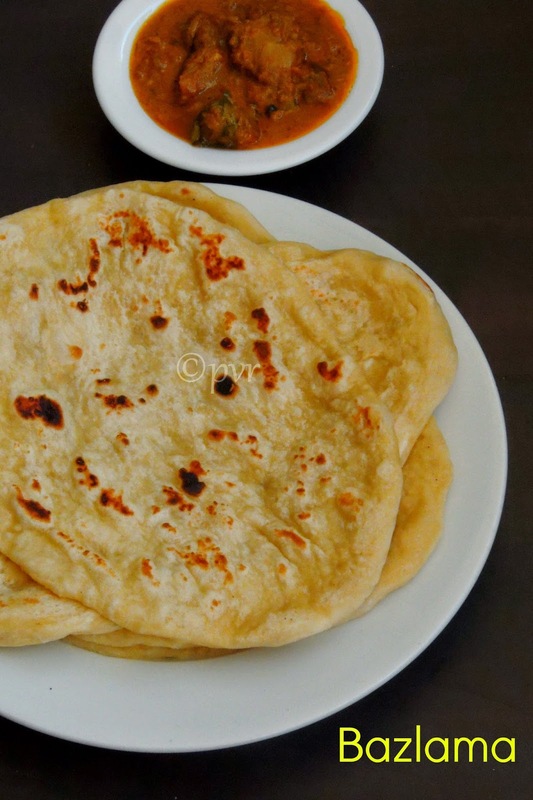 The most popular type of roti of Srilanka is Pol roti, this stove topped flat bread made either with wheat flour/maida or else Kurakkan flour which means finger millet flour or else a mixture of both flours and freshly scraped coconut. However onions, chopped green chillies can be added to this mixture before cooking. Obviously Pol roti can be prepared either as savoury ones or sweet ones. These are usually thicker and harder than other rotis exists. 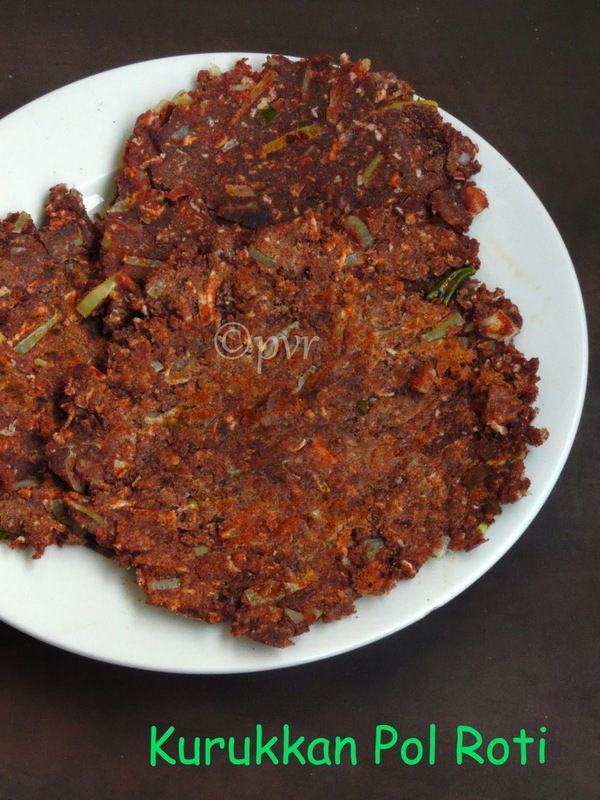 This healthy rotis can be usually eaten with any type of curries or else Srilankan side dishes like coconut sambol and lunu miris (a mixture of onion and maldives fish). Pol rotis are eaten for breakfast or else for dinner needless to say that these rotis are considered as main meal rather than a supplement. 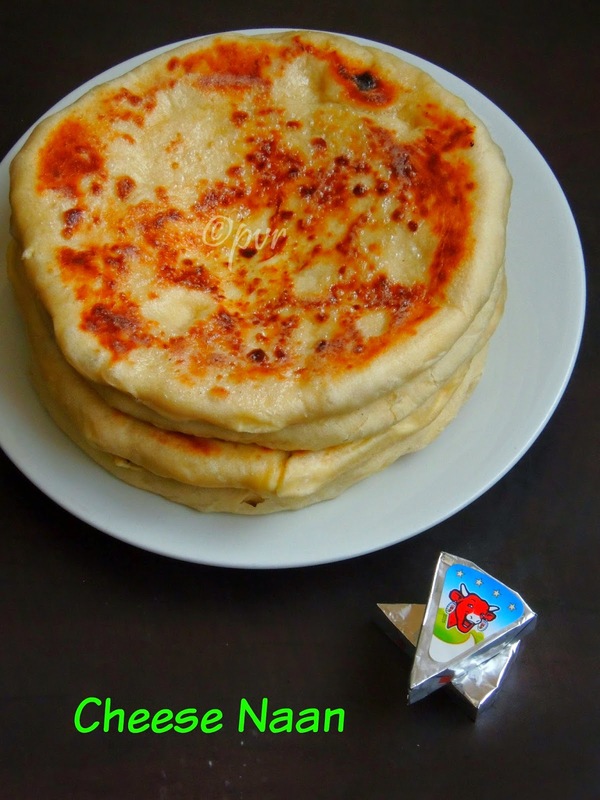 As per wiki, Bazlama is a popular flatbread made from wheat flour, water, table salt, and yeast. After mixing and two to three hours fermentation, the dough are divided, rounded, shaped to desired thickness and cooked on a hot plate. During cooking, the bread is turned over to get cook the other side. After baking, it is generally consumed fresh. Shelf life of bazlama varies from several hours to a few days, depending on storage conditions. This is a Turkish flatbread which can be consumed with different side dishes.